Yesterday I mentioned that I wanted to try a baked tofu recipe. I wasn’t totally sold on this concept, mainly for the same reason stated in the post – I like crispy tofu with a soft center and I wasn’t sure how baking would get that crunch. I prepped this last night, substituting chili garlic sauce for the sriracha and peanut oil for sesame oil. 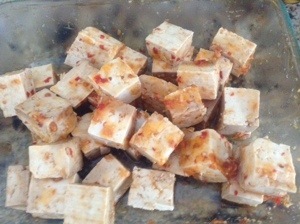 I pressed the tofu, cut it into cubes and let it soak overnight. When I got home from work today I drained, dusted and started baking the tofu. This worked pretty well, but it does take longer than pan frying. 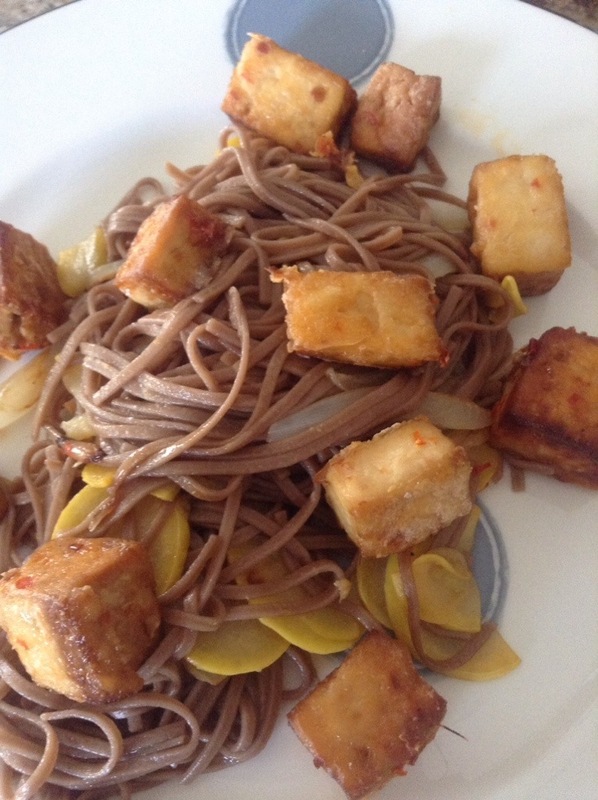 It did leave me plenty of time to cook up some soba noodles and onion and squash. I used the reserved marinade for a light sauce (need to double the sauce/marinade for the noodles. I didn’t, but I should have) and put it all together. This isn’t the most colorful meal I’ve ever made, but I have to say, I was really pleased with the flavors here. There was just enough spice that you felt it, but not so much that it overpowered the dish. I loved the crunchy tofu with the soft noodles. I’m thinking more sauce, add crushed peanuts and maybe carrots next time. 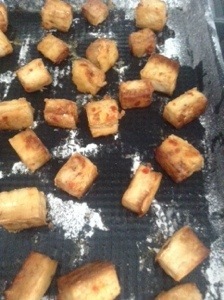 And I’ll probably pan fry the tofu, but I am a press and marinade convert. It works!